Of all the craft beer friendly events in Los Angeles, few that I have taken part in have been as different, exciting, or memorable as experiencing the LA Derby Dolls for the first time. Initially introduced to the sport by Tony Yanow of Golden Road, I have since attended several matches and would highly recommend it as a fun night out for anyone. For starters, what exactly is roller derby? 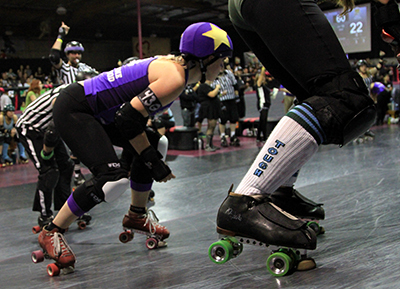 In the simplest terms, it is a contact sport built around competitive roller skating in which players race around a track in an attempt to pass defensive players, gaining points for each opponent passed. The rules are however a bit more complicated and best learned through observation. I myself am still learning. The common misconception that the sport is somehow fake or in any way like Pro Wrestling is completely inaccurate in today’s sport. If I had to guess I’d say that misconception originated with the late-80s TV show ROLLERGAMES. 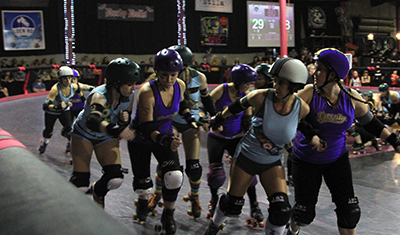 Though after the height of its popularity in the 1970’s the sport shifted toward style over substance, modern roller derby is very competitive, highly officiated sport with nearly as many officials as players. 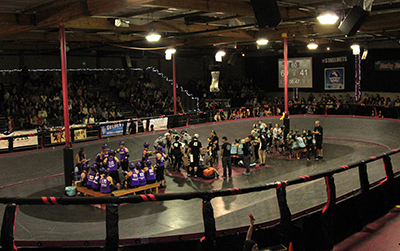 The LA Derby Dolls also have Junior Teams and training programs for skaters and officials alike. Yes, the sport has a style all its own, with pun-based player names and themed teams, but the sportsmanship is as authentic as it gets. So what is the craft beer connection? Well, though Tony has been an avid fan who has rarely missed a match in the last eleven years, It has only been for about the last year that Golden Road Brewing has been an official sponsor. Though Tony’s Darts Away had held raffles and other events involving the Dolls, it is only recently that you see evidence of a marriage between the two. When you walk into the warehouse-like event space (lovingly nicknamed the Doll Factory), there is Golden Road beer and signage everywhere you look. Cocktails (Sailor Jerry is also a sponsor) and beer are both available for the first half only, but can be purchased from two stands or from a number of servers pushing rolling coolers around the event. 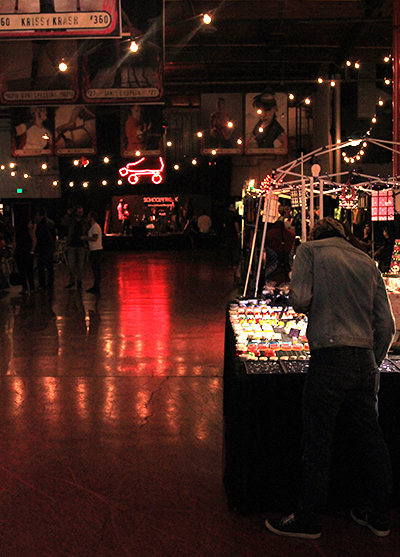 The Doll Factory also hosts some of LA’s best food trucks on any given game night and an indoor market of local artists, clothing vendors, and more. Like craft beer, roller derby is experiencing a nation-wide resurgence right now. In the eleven years since the LA Derby Dolls was founded by Rebecca Ninburg (a.k.a.Demolicious) and Wendy Templeton (a.k.a. Thora Zeen), they have grown as an organization with an ever-expanding fan base. At one time the Dolls competed in a space in Little Tokyo, but quickly outgrew their Fire Marshall authorized capacity. Now, they search for an even larger home as attendance has maximized their current Temple St. Location. With a successful IndieGoGo campaign completed in September, they should be making the move as soon as a suitable space presents itself. At least one factor in the selection of the new space will surely be how partner Golden Road fits into the facilty. An adjacent tap room would not be out of the question and would have great benefits for both parties. With this year’s regular season having wrapped up at last Saturday’s Championship match, I look forward to announcement of more details in the coming months. The next event on the Derby Dolls Calendar is a January 24th Double Header: Baby Doll Brawl/Juniors Exhibition Bout. Stay tuned to the LADD Calendar for ticketing information.